So you would absolutely LOVE it if you could get rid of that 50 foot long cable running from your router in one room to your 360 in the other? Oh, you would actually love it even more if you could move your 360 upstairs into the bedroom that's about 300 feet away, in and out of doors? We got several options for you with NO modifications to your Xbox 360. Looks: It's very stylish and matches the Xbox 360 very well. This isn't a good reason for the price overhaul, but it is a small enough reason to include it. Size: Let's face it. This thing is t-i-n-y. For everything that's in it, it's small. Dual-Band: That's right. You may not use it, but it includes 802.11a as well as b and g. This, like it or not, along with it's size is a huge cost factor. Features and Ease of Use: We decided to put these two together because they really fit under one term and that is development time. It takes time and money to develop the code and so forth for making this thing work so well with the 360. The ability to instantly work while tracking down any a/b/g frequency is great. Unfortunately, this development time and money went to including a key code that will ONLY allow communication between the 360 and Microsoft's adapter. No 3rd parties have this code and I doubt Microsoft will give it away. That's why you don't see 3rd party adapters. USB Power: This thing works without external power and straight through the USB port. I know, I know, USB 2.0 was always meant to allow power management through the port itself, but a lot of Wi-Fi adapters can't do it. They need more power. Microsoft: Yup, that's right. We'll say it. Microsoft themselves like to overprice a lot of their hardware throughout the computer and video game industries. So, now you're probably saying, "yeah, that's all good and dandy, but what the hell can I do about this?". Well, we'll list some other options you have. Options that don't include any modifications to your 360, what-so-ever. First though, let us list a few things that WILL NOT WORK! USB Adapter: Remember the special code that we mentioned before? The reason behind no 3rd party adapters being made? This is why it's not possible to go out and just buy any wireless adapter. No way, no how. Sorry folks. Wi-Fi Memory card and USB Card Reader: Obviously, this is still using the USB port for sending and receiving wireless connections. It WON'T work. Ethernet to Wireless Bridge: This can be pretty easy to do. How easy though, depends on which you buy. We have two different bridges here at VGE that we sell. We'll get to those in a bit. Wireless Access Point: This is basically the same as a bridge, except you need to make sure the options are available for bridging. Usually a repeater can also bridge. You may need to set up the options through your PC first, and then plug them into your ethernet port on your 360. Powerline/Wall-plugged Ethernet Bridge: This is technology that has been getting pushed around a bit for about 10 years and has finally started being sold to consumers. We don't really like this way too much because it's still slow unless you spend a hunk of change on an adapter. Cheaper adapters do exist, but they seem to be slow. So, it's all up to you. We have two different bridges/access points here at VGE Utopia. We offer the D-Link DWL-G730AP High Speed Wireless Pocket Router/AP for only 54.99 including all taxes shipping (as usual). The D-Link is very small and would be pretty unnoticeable amongst your entertainment set up. We also sell the TRENDnet TEW-430APB 54Mbps 802.11g Wireless Access Point. Anyways, you will probably need to connect the TRENDnet to your computer first to set it up. It comes with a resource CD just for manuals, updates and setup. You don't need to use the disk because you can go through the IP address and set it up online. The D-Link should be a little easier since it has less options. Most Xbox 360's should be able to plug and play. You may still need to tinker it a bit. It all depends on your console, network and settings. Also, the D-Link uses b/g standards while the TRENDnet only uses 802.11g. Keep that in mind. Good luck and let us know what you think below! Article by: DarkLinkofUtopia - Copyright 2009 and we include 10 feet of CAT5e RJ45 (ethernet) cable. This one is bigger, but costs a little less. It also has more features and looks more like a full fledged router does. The price at 46.99 may, however, make you forget about it's size. Besides, you could just throw it behind the tv, right? There is also one more thing that we forgot to mention. The original Microsoft Xbox adapter will work. This should be logical if you read what we wrote about the ethernet port being the only way that connections are not blocked by code. If the other ethernet bridges work, then obviously the original Xbox adapters will work as well. It should be worht mentioning however, that finding one is hard and when you do, they are rather expensive. It seems the sellers realize just how valuable they are. 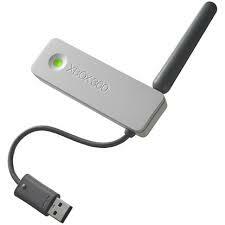 Grant it, they are cheaper than the 360's wi-fi adapter, but more expensive than our suggestions. You'll pay, on average, about $60 to $70, and that's for used adapters. You may get lucky though and find one in a bargain bin somewhere for very cheap, so all the power to ya if you can! We'll try and track some down here in the next couple days and either point them out or sell them for dirt cheap.